Don’t write like you talk. I know — I said the opposite yesterday, but it’s good advice either way. If we really wrote like we talk, readers would find it impossible to understand. Real conversation is jumpy, messy, and inexact. We meander around topics, we stop and start and change direction midstream. We pepper our speech with ums, uhs, likes and y’knows. None of that would make for pleasant reading. What’s nice about writing is that there is time to think, plan, and choose words carefully. We have time to tidy up the muck and clutter of everyday spoken English. Write like you talk, but not exactly like you talk. Write like you would talk if you had all time in the world to prepare you words. Bloggers love comments. Leave your reply below. Hi, liked your blog. 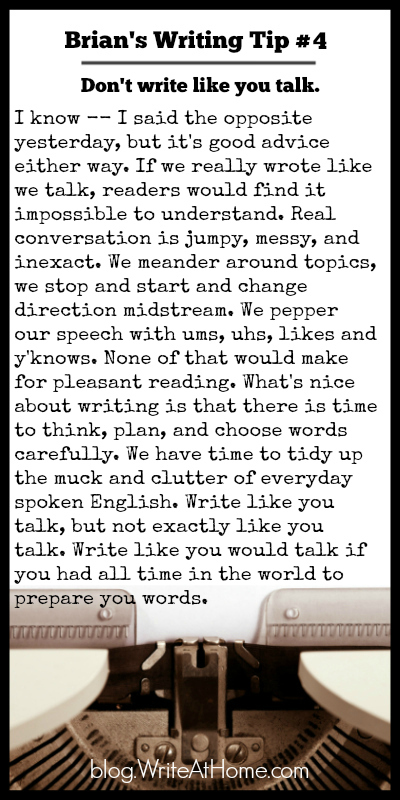 Just couldn’t help the irony of pointing out a missing word in this blog post about not writing like you talk. This energizing post made me laugh – vividly recalling all those times my friends and I have used the word “uncouth” – all the while feeling slightly superior because we are (quite naturally) more refined. It never crossed my mind to think of the word “couth” – but now I know. Appreciate the insights, Brian…and the smiles.